Panic disorder is a frequent and clinically relevant medical entity with a high lifetime prevalence and significant impact on psychosocial stability and function. Regarding the clinical presentation, there are obvious similarities in paroxysmal neurological disorders such as seizures and focal epilepsies. In this context, the detection of EEG abnormalities during the attacks or in asymptomatic intervals, continuously or rhythmical, is of significant interest. Likewise, isolated epileptic discharges (IEDs) are important components of epilepsy. On the other hand, IEDs are also common in non-epileptic psychiatric patients. It is not known exactly which role IEDs play in the genesis of behavioural aberrations. 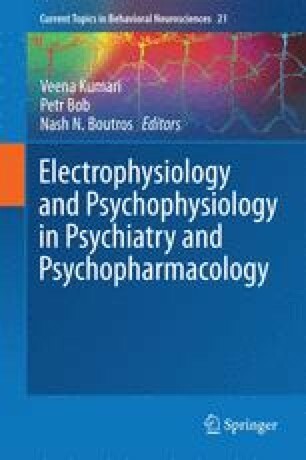 In this chapter, attention is directed towards this issue and its relevance to managing psychiatric patients suffering from panic disorder (PD), as well as understanding the complex relationship between IEDs and the pathophysiology of PD. Two main conclusions are being proposed. First, patients suffering from PD may show a higher rate of unspecific EEG abnormalities and increased beta power, pointing to a state of hyperarousal. Secondly, if first-line treatment of PD fails, the use of antiepileptic drugs (AEDs) should be considered. There is enough evidence to suggest that IEDs play a significant role in the genesis of PD and that this relationship is far from clear, warranting more research in this field. This article gives an overview of the current literature on the pathophysiology of PD, including studies on altered microstates, coherence imaging and alpha asymmetry.